Hello everyone! We spent the weekend at our cabin and had the most amazing time. The weather was beautiful - well, Canadian winter beautiful. It was just above freezing and the sun was shinning. We went skating on the lake ... just the five of us. It was the first time Saraya was on skates and she picked it up in about five minutes. We spent hours out there skating and playing hockey. The kids even made us go for one more hour of skating Sunday before we hit the highway to come home. Today I am designing for the Global Design Team. You can find my creations, right here, each Monday. 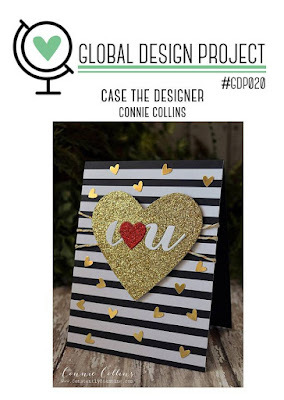 This week my project is inspired from this challenge - CASE the Designer, Connie Collins. I am on 3 design teams with the amazing Connie Collins ... the 2015-2016 Artisan Design Team, the Global Design Project and the Fancy Friday Blog Hop! She is one SUPER talented stamper! My card was inspired by Connie's layout for the challenge sketch. I was in the mood for some watercolor so I switched up the stripe background for this pink beauty. Did I invent a new Technique!? You be the judge! Pinterest told me that you can create watercolor techniques by adding things to the wash when it is wet. (This was discovered and Pinned late at night, in bed). When I was crafting I was too lazy to look up what exactly I should be sprinkling on so I went to my studio coffee bar and looked for something to play with. I found Splenda - yes, Splenda the sugar free sweetener for your coffee. I tossed it on the wet watercolor. It was a hot mess. With nothing to loose I tapped a lot off into the garbage can and decided to hit it with the heat tool to see what would happen. It melted and looked kind of cool on the watercolor card! It is a splotchy embossed look! Sooo - hit or miss? What do you think? Click over the the Global Design Project. You will want to see what the rest of the design team has created to inspire you this week. Scroll down to the bottom of the post to see all of the entries from stampers around the world. We would love to have you join the challenge and play along! Thank-you for reading! Have an amazing week friends!